• You don't like the background music but love its frame of the video. • There are some noises in the video which is recorded by yourself. So we need to remove audio from video file with video quality remained due to the issues we mentioned above. If you want to remove sound from video, Video Editor is one of your best choice. Video Editor can assist you in removing audio from video files with format like AVI, MP4, MKV, FLV, VOB, WMV, MOV, etc. You can split audio from video in short time by using this powerful program. Besides, it also allows you to add and edit your own audio file to video. Now download and install this program and follow the step and step tutorial below to delete your audio file. One of the functions of Video Editor enables you to split the sound from many video like FLV, MP4, AVI, MOV, etc. Open this program, then select the Full Featured Mode. Click "IMPORT" icon to add your video files. Also, you can click the drop-down menu to select options: "Import Media Files", "Import a Media Folder", Import from Camera or Phone", etc. Drag the video file to the timeline. Right click the video located on the timeline and select the "Audio Detach". Then you can find the separate audio in the music timeline. Right click the audio file and choose the "Delete" option to remove the original sound. If necessary, you can personalize your video by using other functions. Right click the audio file and choose the "Delete" option to remove the original sound. If necessary, you can personalize your video by using other functions. Find and click on "EXPORT" button. In the pop-up window, select your desired output format and change the output description. If you want to set the video quality, click the "Settings" icon. Then you can select the video quality, Encoder, Resolution, Frame Rate and Bit Rate here. Now click the "Export" icon to save the video without original sound. Note: If you add multiple video and extract the audio on the timeline, you need to highlight one by one then click "Create Video" to save the separate files. 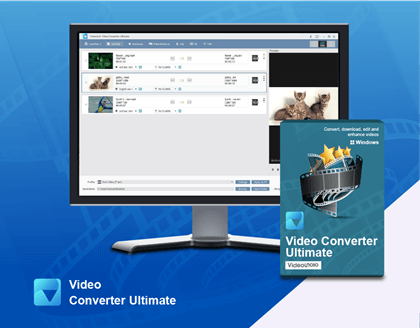 With this program, you can easily delete sound from MKV, MP4, AVI, MOV, WMV, FLV, etc. Besides acting as a professional audio remover, it is also a powerful Video Editor which provides various editing functions to make a stunning video. Download from below link on your Window or Mac and starting enjoying right now.